Jessica.Y, one of the frequent subscribers to this blog, asked me about the medical service system in Japan. The prices of medical services are regulated by the Ministry of Health, Labor and Welfare. Every diagnostic approach and method of treatment is reasonably priced by the authority. When a cutting-edge medical technology is developed, it would be investigated for a few years and if it turn out to be effective, the new technology is listed in the coverage of official medical insurance. All the methods and approaches of medical service that have their official prices are covered by the official medical insurance. There are different kinds of official medical insurance and all the Japanese have a certain official medical insurance. Have you ever seen the movie "John Q"? The situation of "John Q" would never happen in Japan. No matter how rich or how poor people are, they can receive the same level of medical service across the country. Moreover, people of low income who get welfare payments are completely exempt from the medical charge. Japanese medical doctors have better incomes than the average people, but their incomes are lower than those of medical doctors in the western countries. However, I think that this system is good and can be the model for other developed countries. What Jessica.Y wrote on the comment column of Apr. 27th is true. I had my house built 5 years ago. I asked one of the biggest housing companies, Sekisui House, to draw the design. All my family had discussions with the designer again and again. Finally it took three months to draw the blueprint. This entry's topic is my garden. I want to have many friends come to my house and have parties. My family are real party animals. Additionally I wanted to make a space for my dog to run. If you want to make the dog run, you never place stones as in a typical Japanese garden and you have to give up raising flowers. Big stones might hurt the dog and the flowers would be ruined by the dog. If you want to enjoy a barbecue, you have to think about an outside sink where you can get a water supply and where you can wash the barbecue utensils after the party. After such discussions, my garden was made up. By the way, Sekisui House holds the annual design contest in the company to have designers motivated and develop their capabilities. 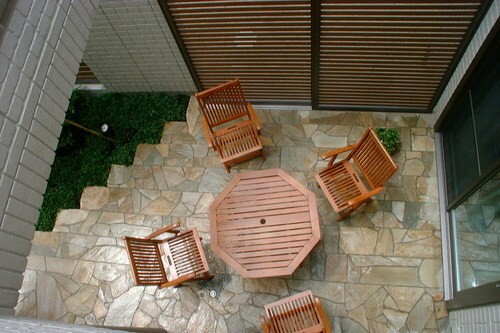 The design of my garden won the first prize five years ago. When I cleaned my room today, I found the CD that the designer sent to me but I didn't watch it at that time. I placedthe pictures in the left column in this blog so take a look! I got an e-mail from my eldest daughter, Eri, a university student who lives in Tokyo. The following picture was attached to her mail. 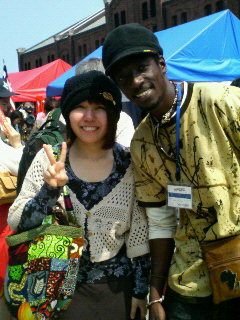 African Fiesta 2008, sponsored by the Japanese Foreign Ministry, was held in Yokohama City and Eri visited for fun. She happened to see the booth of Senegal and tried to dance the newest style of sabre dance from Senegal in front of the booth to their ethnic music. The Senegalese in the booth were so astonished to see her dance, because her dance steps were the most recent ones. "How do you know this dance?" She was asked. She took some pictures of her and them and sent me one of them. She sounds like she enjoyed African culture and food and chatting in French. By the way, I don't know how she knew the dance, but she had practised jazz dance for more than 10 years since she was in short pants. She was so talented that was selected at the age of 12 as a member of the dance team dispatched by my city to Sacramento in California, USA. Sacramento is the sister city of my city and both cities have been mutually exchanging cultural envoys every two years. I guess when she was watching the performances on the stage for the first time, she might have picked up their steps. 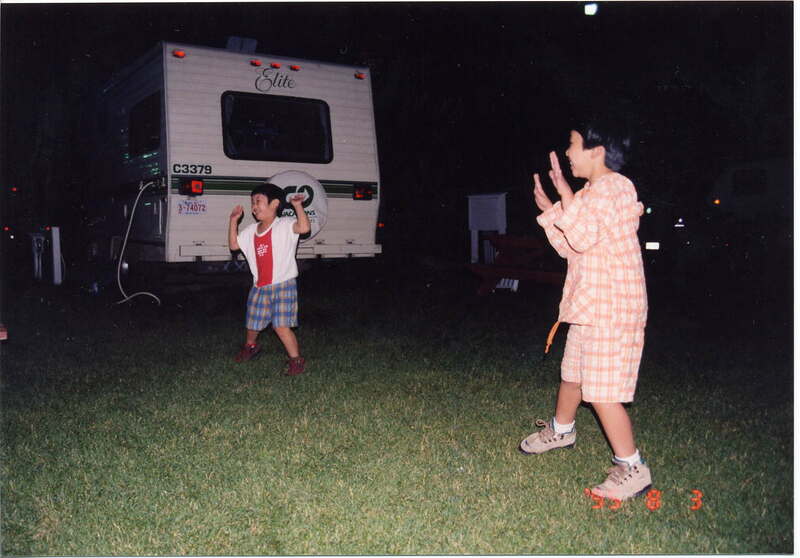 She likes dancing and I'm showing an old picture in which Eri and Yuri, the second daughter, were dancing at a campground in Canmore, near Banff in Alberta in 1995. The picture shows the cover of this week's TIME magazine. It tells us how miserable Burma's situation is. The Japanese media call Burma Myanmar, in spite of the fact that refugees from Burma call themselves Burmese not Myanmese. The Japanese media are disgraceful. 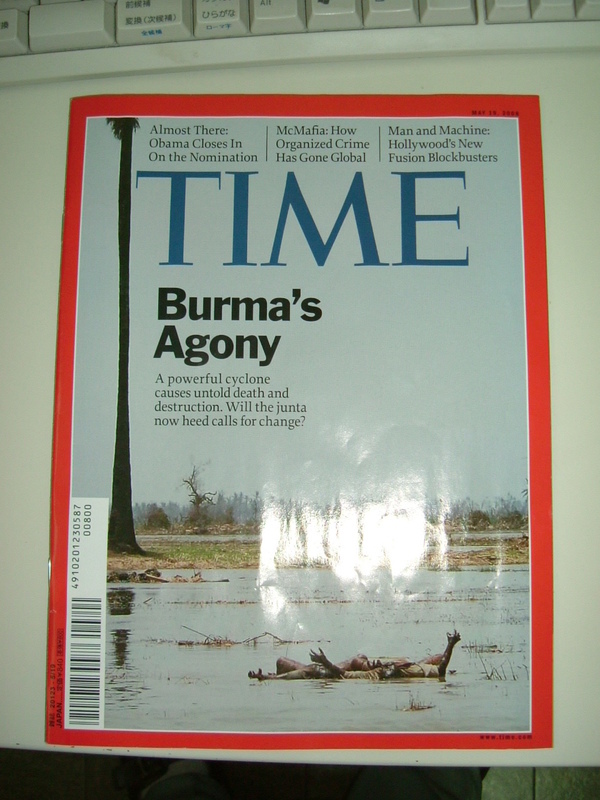 Time magazine has consistently used Burma not Myanmar since the coup d'etat in 1989. The writer in the magazine puts it like this, "Burma, also known as Myanmar." Such an attitude that acts according to their principles is honorable. It might be one of the reasons why I read this magazine. I came back to Matsuyama City by the same ferry before it got dark. It's not so often I can see the scenery of the port from the sea and I enjoyed the lovely views from the deck. I'll show you "Turner Toh" reef that is just outside the port. 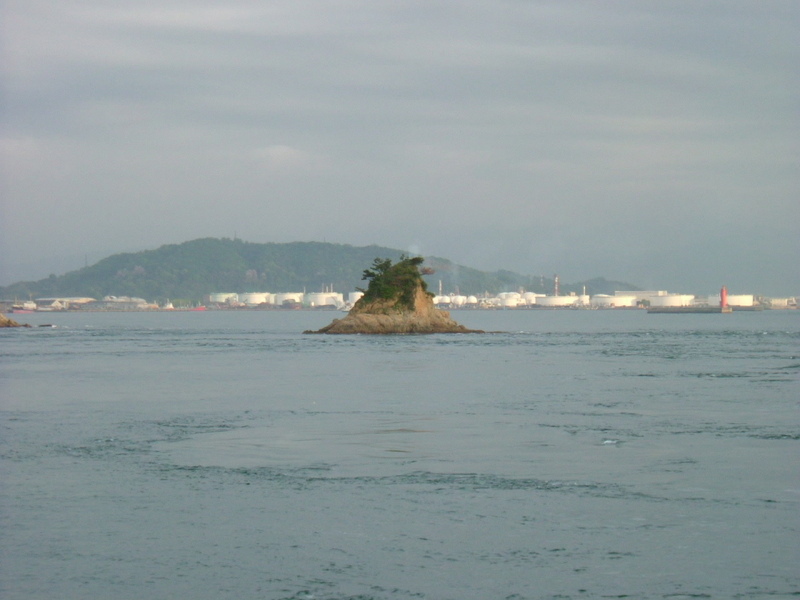 "Turner Toh" is the nickname of this reef and the original name is "Shijuu shima". 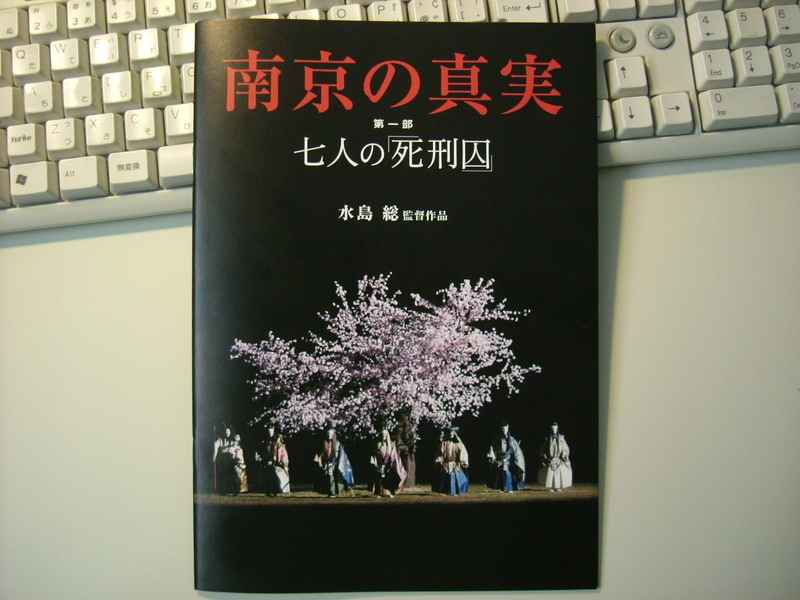 This nickname was named in a famous novel, "Bocchan", that was the story of a teacher who worked in Matsuyama City in the Meiji era. Japan consists of small islands. The four biggest islands are called "Hokkaido", "Honshu", "Kyushu" and "Shikoku". My hometown is on Shikoku island, the smallest one of these four islands. The water area that lies at the north of Shikoku is called the Seto Inland Sea. This sea is known as the most peaceful sea in Japan. The ferry boat that I got on was very slow and was overtaken by a small boat. You might figure out how calm this sea was from the picture. 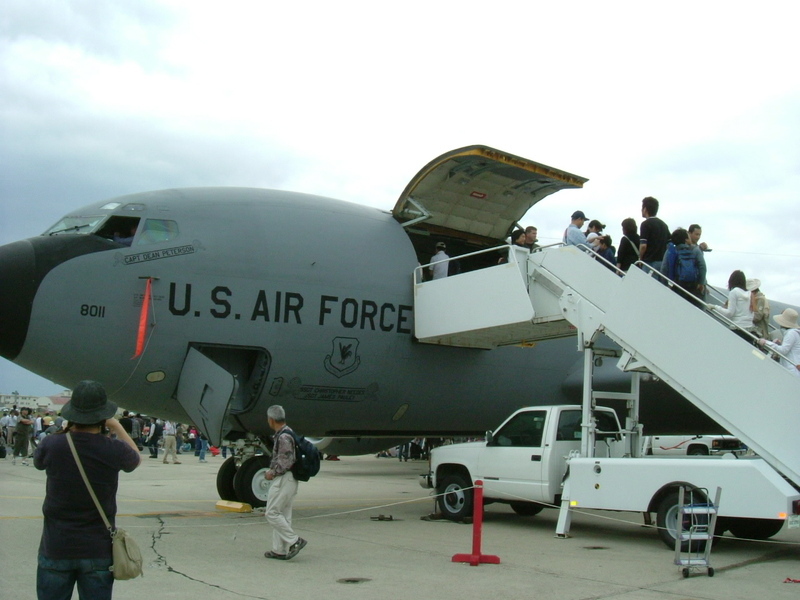 The annual air show was put on at Marine Corps Air Station in Iwakuni City on May 5th. I knew about this Friendship Day long ago, but it was the first time I had attended it. I had been interested in this event, but didn't have a chance to visit the station. The days between Apr. 29th and May. 5th are called Golden Week in Japan and it's also a holiday week. I can take consecutive days-off during this week and would rather go out for a longer trip than a day trip. This is the only reason that I haven't been to MCAS Iwakuni. Iwakuni City is located on the coast of Chugoku District, just on the opposite side of my hometown across Seto Inland Sea. I went there by a ferry that was chartered by the tour company. 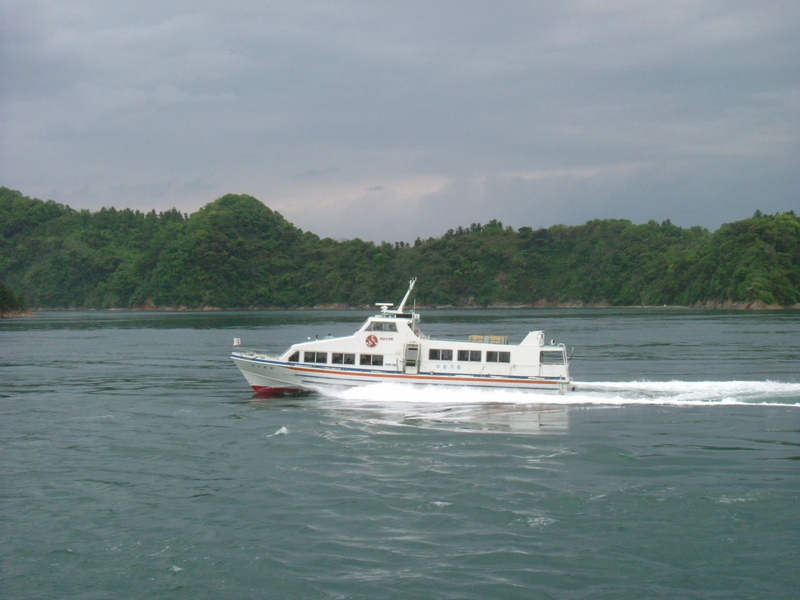 This ferry was going to enter the military port of MCAS Iwakuni. I couldn't wait to arrive at the port, but there were no military vessels and moreover taking pictures was prohibited. The ferry was designed for a short service like 30 minutes at the longest. I had to stay on that ferry more than 3 hours. It was really an ordeal. The air show was great and I enjoyed it. The first picture is the ferry boat that I got on. 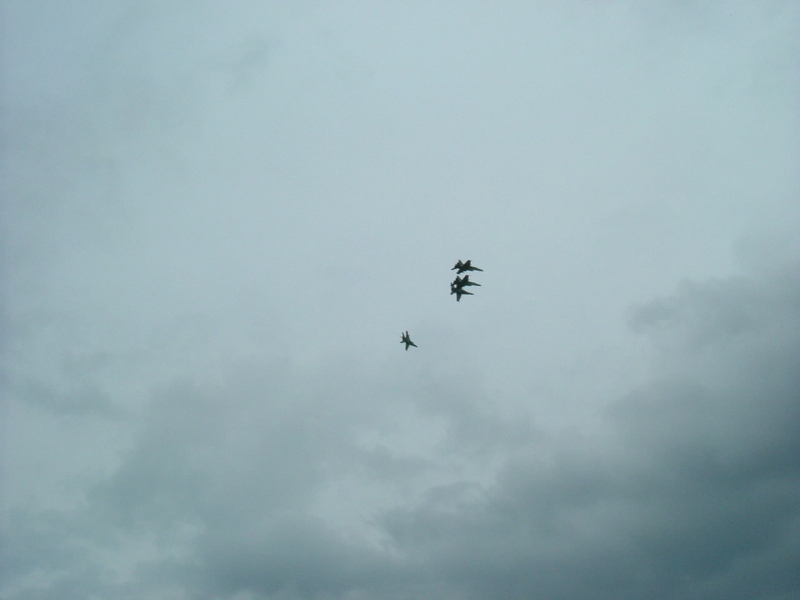 The second is of a transport aircraft and the last is military jets (F18 Hornets) performing aerobatics at the air show.